Could SIBO Be Preventing Your Remission from Hashimoto’s? Many people with Hashimoto’s feel significantly better when they remove reactive foods, replenish nutrient depletions with restorative foods and supplements, and support the gut with probiotics. But what if those steps alone don’t work? You have to dig a bit deeper. It took more than the implementation of the strategies above for me to resolve all my symptoms related to Hashimoto’s. In fact, in some cases, my attempts to produce healing led to the development of additional, different symptoms altogether. Searching for the solution that will work for you can sometimes feel like trying to find a needle in a haystack, but the right combination of protocols for you is out there. When symptoms don’t subside in response to what might be considered the standard approach in functional medicine—removing, replenishing, and repairing—there is a good chance that you have an unaddressed infection. There are many infections that have been implicated in triggering Hashimoto’s, but the most common ones I see in my clients include H. pylori, yeast overgrowth, Blastocystis hominis, and reactivated Epstein-Barr virus. Additionally, people with hypothyroidism may have SIBO, or small intestinal bacterial overgrowth. While this is not technically an infection, SIBO does have a bacterial component and can be a trigger, consequence, or exacerbating factor for Hashimoto’s! In fact, a 2007 study found that about 50% of people with hypothyroidism have SIBO, while a 2017 study found that levothyroxine use can contribute to the development of SIBO! SIBO stands for small intestinal bacterial overgrowth. Our small intestine is meant to be relatively clear of bacteria, while the large intestine houses most of our bacterial friends and foes. In some cases, bacteria from the large intestine may make their way up and overgrow into the small intestine. Once you have SIBO, it can lead to intestinal permeability and contribute to a long list of digestive symptoms including acid reflux, belching, bloating, and irritable bowel syndrome (diarrhea, constipation, or mixed type). SIBO often presents with bloating after eating and the annoying “I woke up with a flat stomach and now I look pregnant syndrome” caused by bacteria in the small intestine making too much gas. Conditions like IBS, hypothyroidism, fibromyalgia, and restless leg syndrome have all been tied to SIBO. SIBO can also cause a depletion of vitamin B12 and iron, and lessen levels of digestive enzymes like lactase (digests lactose in dairy) and amylase (digests starch), making it more difficult to digest many foods. If you’ve noticed that fibrous foods, fermented foods, histamine-containing foods, prebiotics, cruciferous foods, and/or the use of probiotics seem to cause a flare up in your digestive symptoms, there’s a good chance you have an overgrowth of bacteria in your small intestines. Also, if you’ve found that using antibiotics or antimicrobial herbs, even when used for unrelated reasons, makes you feel better, this could also indicate the presence of SIBO. Substances with antimicrobial properties can suppress the bacteria, leading to temporary relief of symptoms. Additionally, people who feel better when fasting and skipping meals and have the flattest stomachs when they first wake up are likely to have SIBO, as this will prevent the bacterial from gorging on our food, producing gas and replicating. While yeast overgrowth and most sources of gut infection can be detected in a stool test, SIBO is best revealed in a breath test. This is because the breath allows us to determine the presence of gas-producing bacteria. The gas is emitted because of fermenting bacteria, which will usually produce measurable levels of hydrogen and methane. Because SIBO is a hot new topic in the gut world, some more progressive conventional medicine doctors may be willing to test you for it—although you may have to be proactive and ask for the test yourself. Functional medicine practitioners, gastroenterologists, and major Academic Treatment Centers will have access to advanced diagnostic tests, possibly administered using a breath-testing machine. Otherwise, you can order a SIBO breath test kit that uses Lactulose to stimulate the bacteria to release their giveaway gases. SIBO breath tests are offered by the following labs: BioHealth Laboratory, Commonwealth Laboratories, and Genova Diagnostics. It’s important to find out if you have SIBO because treating a bacterial overgrowth can not only help regenerate your sugar digestive enzymes, greatly improving digestion, it may also result in remission from Hashimoto’s in some cases. SIBO can be a root cause, consequence, or exacerbating factor of Hashimoto’s. 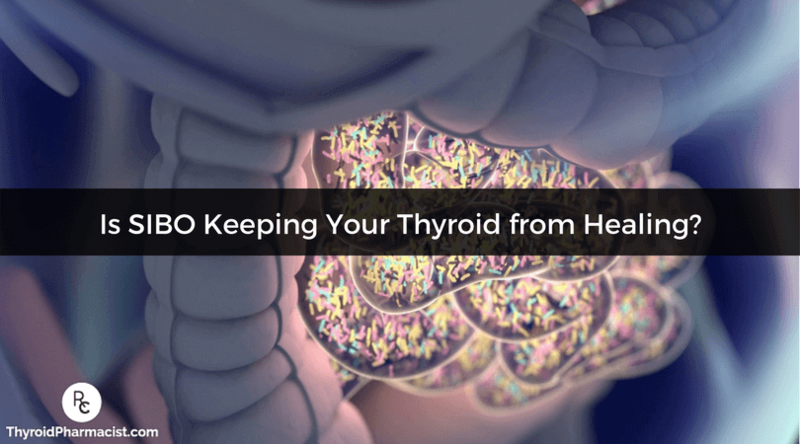 I have seen people with Hashimoto’s resolve symptoms like IBS, restless leg syndrome, low ferritin, and low B12 by treating SIBO, and in some cases, I’ve also seen thyroid antibodies reduced—and even go away—with SIBO treatment. There are a few protocols which can be used in the eradication of SIBO. You can try a pharmacologic approach, which relies on antibiotics, and/or an herbal approach that focuses on the use of antimicrobial herbs. My clients have also had some success using specific dietary approaches, such as the elemental diet, the Specific Carbohydrate Diet, the Low FODMAPS diet, or the GAPS diet. Even if you don’t choose to take a dietary approach, it is recommended during the treatment of SIBO (or suspected SIBO) that you limit starchy foods, fiber, and the use of probiotics that contain prebiotics like fructooligosaccharides (FOS), inulin, Arabic gum, as well as foods with high prebiotic foods (this is similar to a low FODMAPS diet, see below). Foods with high prebiotic content include chicory root, Jerusalem artichoke, dandelion, garlic, leek, onion, and asparagus. 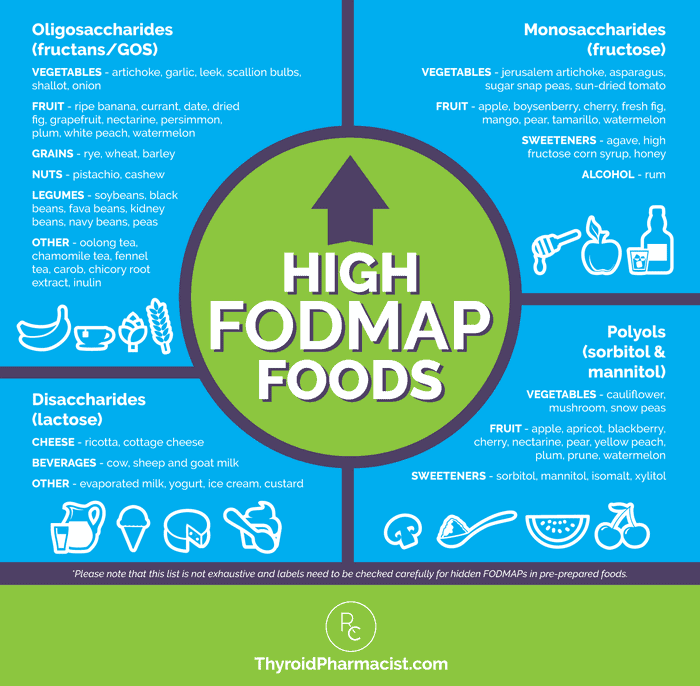 For a full overview of the low FODMAPs approach, please check out Root Cause. Peppermint oil has been found to be helpful for SIBO as well, however, most brands of peppermint oil contain soy, so drinking peppermint tea may be a better alternative. According to Dr. Allison Siebecker, creator of the informative website SIBOinfo.com, the antibiotics metronidazole, rifaximin (Xifaxan™), and neomycin have been used to treat small intestinal bacterial overgrowth because of their ability to stay in the intestines, which prevents them from causing systemic adverse events. Most of my clients who have used this approach have reported positive results, though it’s important to note that not all insurance companies cover Rifaximin—and the out of pocket cost may be high! Berberine, oregano, and garlic are all herbal antimicrobials that can help eliminate bacterial overgrowth. There are four possible dietary approaches to getting rid of SIBO: the elemental diet, the Specific Carbohydrate Diet, the Low FODMAPS diet, or the GAPS diet. The elemental diet is a liquid diet that is free of non-digestible substances such as fiber, complex carbohydrates, and protein structures. It contains our essential macronutrients in a state that requires little to no digestion and results in complete absorption and has been traditionally used for rehabilitation of severely malnourished individuals, bowel inflammation, and diarrhea. The elemental diet is a low-residue diet that is composed of free amino acids and fat in liquid form. Amino acids, glucose, fat, and vitamin/mineral supplements are utilized instead of food. Because it results in reduced secretion of pancreatic and gastric juices, this diet gives the stomach and pancreas a rest from activity and allows for healing and reduction of inflammation to take place. Additionally, free form amino acids allow for the body’s own protein to be spared, helping the rest of the body heal quicker. An elemental diet may be extremely beneficial in kick-starting the thyroid healing process. This diet causes a rapid shift in bacterial flora within one to two weeks. Since it is an extremely low-residue diet, it requires no digestion and does not provide any food to the pathogenic bacteria, thus starving them. Clinical trials have shown that this diet is effective in reducing SIBO within two weeks in people with IBS, resulting in a substantial improvement of symptoms in as many as 80% of people. The drawbacks of the diet are that amino acids are expensive and taste pretty disgusting, if not properly prepared. People report feeling nauseated after drinking the solution, and aspiration has resulted when people would lie down too quickly following ingestion. Commercially available formulas (e.g. Vivanox®) contain a lot of artificial ingredients people with Hashimoto’s may not tolerate. They also include a lot of carbohydrates, which can cause high blood sugar and harm adrenal function. In recent times, the company Integrative Therapeutics came up with a cleaner version of the elemental diet—the Physician’s Elemental Diet. This formulation has become my go-to recommendation for people with Hashimoto’s. Some critics of the elemental diets also noticed that symptoms sometimes return after a period of time ranging from months to years. I think this is likely because people go back to their junk food diets too soon. However, if an elemental diet was followed by a grain-free FODMAPS diet, SCD Diet, or similar diet, this could result in permanent remission. I do not recommend attempting the elemental diet in a person with compromised adrenal function and other types of infections like parasitic infections. Elemental diets should be used under the supervision of a health care professional and in the case of confirmed SIBO. A homemade elemental diet is available in the Companion Guide to the book, which you can download at thyroidpharmacist.com/guide. As this diet requires the purchase of expensive amino acids, however, it can be quite pricey. The Specific Carbohydrate Diet (SCD) and the Gut and Psychology Syndrome (GAPS) Diet eliminate grains, sugars, and starches and only allow carbohydrates to be eaten in the form of fruits and honey, and certain kinds of specifically fermented yogurts. It is very similar to the Autoimmune Paleo Diet [AIP] well-known in the Hashimoto’s community, with the exception that it does not allow sweet potatoes due to their starchy content and allows other foods like nuts, seeds, and nightshades that are not AIP approved. I love the website SCDlifestyle.com if you’re looking for more information on these dietary approaches. The low FODMAP diet is considered an effective nutritional therapy for certain digestive disorders, including SIBO. By removing foods high in fermentable oligosaccharides, disaccharides, monosaccharides, and polyols (FODMAPs), this diet essentially cuts off the food supply to the bacteria that may be running amok in your intestines. This is an easy way to describe eliminating possible carbohydrates that could be fermented by gut bacteria. A low FODMAPs diet can help SIBO by multiplying the flora we need for absorption and to potentially starve the pathogenic flora. This happens by avoiding the foods that are fermented by pathogens. There are certain foods, specifically onions, garlic, and beans, which will always be malabsorbed in all individuals—either with or without IBS. These three foods also cause gas production in all individuals. However, when pathogenic bacteria are present, toxic byproducts are produced, causing even more symptoms. 75% of individuals with IBS who follow this diet will see an improvement in symptoms. Although the low FODMAPs allows fruits and vegetables, there are a few that are eliminated. For Hashimoto’s patients, the list is a bit refined due to eliminating dairy and all grains. It’s important to retest for SIBO 5-14 days after the completion of the treatment protocol to determine if in fact the SIBO has been appropriately treated or whether it may be growing back. One way to keep the bacteria from growing back is to ensure that you have sufficient stomach acid, something with which betaine with pepsin may be helpful. Prokinetic agents, that help to move food along and prevent bacteria from “snacking” on the food as it passes, such as low dose naltrexone, may also help prevent the recurrence of SIBO by supporting gastrointestinal motility. I advise you to discuss these potential protocols with your practitioner and let them help identify the best starting point for you based on your health history. While it may take some time, eradicating SIBO can allow for your gut to heal and, ultimately, resolve the intestinal permeability that may have been your Hashimoto’s trigger. The first step is to get tested for SIBO and then make a plan from there. Have you already been tested for SIBO? What methods have you tried to treat it? For continued updates and interaction, be sure to become a part of our Facebook community and sign up for our newsletter. Do you recommend the elemental diet if you also have tested positive for a yeast overgrowth? If you do, what herbs do you recommend with the elemental diet? I have been fighting SIBO for over two years but my functional medicine practioner does not want me to do elemental because I have a yeast overgrowth but after multiple rounds of rifaximin candibactin at/br, allimed, lauricidin, atrantil…and lots of money and time. The elemental is my only option. Please let me know your thoughts …thank you! Jennifer – thank you for following this page. The way that you want to address infections is by starting with the highest infection in your body first. H. pylori is typically found in the stomach (it can also be in the upper part of the small intestine), so that’s going to be the first infection you want to treat. A lot of times, when you treat H. pylori, the SIBO will go away as well. Next would be the parasite. If, after the H.pylori and parasite protocols you still have SIBO, you would treat it at this time. The yeast would be addressed last, if needed. Sometimes when you use the parasite protocol along with the SIBO protocols, the yeast issue is taken care of as well. With the exception of discussing proper thyroid medication dosing, the majority of my website and my book focuses on balancing the immune system. The info I present is based on my own research and journey for overcoming my autoimmune thyroid condition. Would it be possible for your computer techs to figure out a way people could print only the article and not all the extra nonsense on the page (pictures, etc)??? I’ve noticed that some sites have a button at the end of article that says print and can get just article. ( I’ve stopped printing because when one little article uses all the paper and ink because of all the nonsense surrounding it, that is not doable.) I can’t read a lot while looking at computer because the light is very uncomfortable. Sometimes would like to read your articles, but they are too long to do that on the computer. You posted an article recently that dealt with thiamine testing and supplementing. I cannot find it! Could you please let me know where I can find it? Mary – thank you for following this page. Here is an article you might find helpful. Hello good day. Can u email me the link so i can purchase ALl the supplements please? Ann – Thank you for your interest in my new supplement line Rootcology! Here is a link to the site. Regarding the herbal protocol: all of the three options must be taken together or we can combine either candibactin or oil of oregano with allicitin? I have performed two one hour breath test for SIBO and they both came back negative but my GP is convinced I have SIBO. Should I do a 3 hour breath test? All my symptoms have been erradicated except the extreme bloating which is very painful. My doctor recommended a three day cleanse to see if my intestine would clam down. Also, shouldn’t I assume I have Hashimoto’s if I have hypothyroidism? I was on the AIP diet before getting my antibodies tested and it came back negative but I do have hypothyroidism. Thank you. Natalie – thank you for following this page. Most thyroid conditions result from the immune system attacking the thyroid because the immune system is out of balance. Even when the thyroid is taken out surgically, is ‘dead’, or treated with radioactive iodine the autoimmunity still persists in most cases. Many people will have their thyroids removed, and will develop new autoimmune disorders such as Lupus, Rheumatoid arthritis, etc. The immune system just finds a different target. We need to re-balance the immune system to prevent this (sometimes the autoimmunity can be reversed as well). The gut determines your immune system. With the exception of discussing proper thyroid medication dosing, the majority of my website and my book focuses on balancing the immune system. The info I present is based on my own research and journey for overcoming my autoimmune thyroid condition. This is so informative and at the perfect time for me. I don’t have ins like symptoms but do have extreme bloating that will last weeks (or months) from something I ate. I’m about to do the sibo breathe test (lactilose) from Genova. Do you have any natural tips to help with constipation? It says any supplements that assist in this regard are to be avoided for the week prior to the test. I have candida, salicylate sensitivity as well as hashimotos so I’m concerned about doing the elemental diet. My adrenals are already pretty shot, and have high cortisol. I avoid carbohydrates, sugar (even fruit) as much as possible. Might you have any thoughts of what to try? Sorry one last question. If you are going to have a planned ‘cheat’ on vacation and want to have a cocktail. Is there something else to mediate symptoms besides or concurrent with taking charcoal pills? Thank you for your time and most helpful information. Brooke – thank you for following this page. The way that you want to address infections is by starting with the highest infection in your body first. H. pylori is typically found in the stomach (it can also be in the upper part of the small intestine), so that’s going to be the first infection you want to treat. A lot of times, when you treat H. pylori, the SIBO will go away as well. Next would be the parasite. If, after the H.pylori and parasite protocols you still have SIBO, you would treat it at this time. The yeast would be addressed last, if needed. Sometimes when you use the parasite protocol along with the SIBO protocols, the yeast issue is taken care of as well. With the exception of discussing proper thyroid medication dosing, the majority of my website and my book focuses on balancing the immune system. The info I present is based on my own research and journey for overcoming my autoimmune thyroid condition. I have a ton of gurgling going on in my stomach all the time. As I sleep when I wake up. My general saying is if I could live without food I probably would. The problem is I know I also have several Got Bugs including yeast and I’m not sure the best approach for treating possible sibo if I have yeast because it seems like there might be some dietary contraindications. Right now I am taking grapefruit seed extract and a few other things to help get rid of the yeast in my gut. But I also think I need to be tested for the sibo because I feel terrible in my gut all the time. Yes I have a dr. That I will be talking to who is naturopathic doctor. Any suggestions on the combination of things I said try to get rid of this horrible gut-wrenching problem? Celia – thank you for following this page. The way that you want to address infections is by starting with the highest infection in your body first. H. pylori is typically found in the stomach (it can also be in the upper part of the small intestine), so that’s going to be the first infection you want to treat. A lot of times, when you treat H. pylori, the SIBO will go away as well. Next would be the parasite. If, after the H.pylori and parasite protocols you still have SIBO, you would treat it at this time. The yeast would be addressed last, if needed. Sometimes when you use the parasite protocol along with the SIBO protocols, the yeast issue is taken care of as well. With the exception of discussing proper thyroid medication dosing, the majority of my website and my book focuses on balancing the immune system. The info I present is based on my own research and journey for overcoming my autoimmune thyroid condition. Hello Dr. Wentz! I just bought your new book and am feeling hopeful for what lies ahead. I wanted to share, just briefly my success with VSL #3 and I know you mention it in your new book, but saw no mention on this page for Gut issues. VSL # 3 has had an incredibly positive impact and such that when it started working after about 3 days, it dawned on me how I was in so much pain all the time. I had come to accept it, but of course miserable. It is pricey, but worth having a happy tummy. I simply cannot live without it! I try to tell all my Hashimoto friends about it. My only suggestion is that it is purchased directly from a pharmacy, say Walgreens, instead of Amazon; I have read many reviews about the product being delivered warm. (It needs refrigeration)….thank you for sharing this! Marne – thank you for following this page. Here is an article you might find helpful. Thank you for this article and its valuable information. I was wondering: when you say ‘eat gluten free’, is it allowed to eat for example oatmeal gluten free version? I find it extremely hard to imagine my diet without bread of oatmeal to be honest…. Can you give advice in what to do now? What kind of tests should I opt for? I just don’t know where to start.. I am searching for a specialist though.. but it is just too much.. I am still in shock to be honest. Sara – thank you for following this page. I highly recommend that you work with a functional medicine clinician. It’s an entire medical specialty dedicated to finding and treating underlying causes and prevention of serious chronic disease rather than disease symptoms. I have Hashimoto and SIBO. I have had 3 rounds of antibiotics and my next test is sept. 12th I am hoping this time it’s gone. I am reading your book Hashimoto proticol and i seriously have so many questions but one of them is do I wait till the SIBO is gone before startling the 90 day plan and all the suppliments . I’m nervous to take so many supplements. Thank you for helping others also through your experience I was starting to think I was going crazy. Deborah – thank you for following this page. For questions pertaining to the Protocols please contact my team at info@thyroidpharmacist.com and they will be happy to help you. I had a negative test for SIBO with glucose (not lactulose). Tested early in the morning I felt quite ok till lunchtime, but afterwards a felt very sick with headache and exhaustion which made me think that I had SIBO all the same, but in the lower parts of the small intestine. In Switzerland it is very difficult to find a physician testing with lactulose and even more difficult to find somebody who is treating it as you recommend. Oil of oregano, Allicillin). After a few days I began to feel nauseatic and since then have diarrhea. Is it possible with this medication? A part from this I follow the Autoimmune-Paleo-Diet. Catherine – Thank you for following this page. Please, understand that due to liability issues, I am unable to answer specific medical questions, but I highly recommend that you work with a functional medicine clinician. It’s an entire medical specialty dedicated to finding and treating underlying causes and prevention of serious chronic disease rather than disease symptoms. After reading your book and digging deeper into possible root causes I have tested positive for H Pylori, Blasto & SIBO. I’ve seen your answer above to Celia who is in a similar position so I’m confident in the order I should treat these but I’m finding it hard to find anyone to say the natural protocols worked for them. I know you tested positive for these 3 in your journey and I was hoping you would outline which of your protocols you followed and for how long etc. Renae – thank you for following this page. I am so happy you are taking charge of your health. Here are some articles you might find helpful. Dear doctor, I think I have sibo but there is no proper test for this in my country Iran. My practitioner prescribed metronidazole. Does this medicament work in case of diarrhea? We don’t find rifaximin here! Mahshid – I wish I could give you more direct advice but, each person will react differently. I would advise you to ask your personal pharmacist or a trusted clinician who’s care you are under. I am not able to respond directly to these types of questions here. I also have earache.I’m not able to eat foods nor vegtables, any thing but lamb meet and gluten free toast! This has happened to me after taking levothyroxin!!! I feel pain in my right ovary! I’m really worried because of this condition. Loperamide made it worse!! Mahshid – I highly recommend that you work with a functional medicine clinician. It’s an entire medical specialty dedicated to finding and treating underlying causes and prevention of serious chronic disease rather than disease symptoms. I have had Hashimotos for 5.5 years and in the last year developed SIBO. I also have adrenal fatigue which had been improving but then went south with the development of SIBO. I am following an herbal SIBO protocol and am on a strict food limitation diet following Dr. Siebecker’s 2014 food chart. My issue is that due to the adrenal fatigue I had been told to eat every 2.5-3 hours and with the SIBO diet it says to eat every 4-5 hours to let the food pass completely thru. Consequently, I sometimes feel light-headed and nauseous. I don’t want to damage my adrenals and that system further, but I need to get rid of the SIBO or nothing will ever heal. I’ve also stopped most supplements as they contain ingredients which are forbidden on this diet. I am frustrated and more tired than ever. To top it off, the doctor I’ve been working with for years has suffered severe illness and is slipping mentally and I have no idea where to turn for GOOD, knowledgeable advice. Please, can you help me? Saraphine – thank you for reaching out. Please understand I am not able to respond directly to these types of questions here. I highly recommend that you work with a functional medicine clinician. It’s an entire medical specialty dedicated to finding and treating underlying causes and prevention of serious chronic disease rather than disease symptoms. What do you recommend to get Secretory IgA up….mine is 465?? I only tested positive for Citrobacter freundii and C. difficile Toxin B…antibodies seem to be stuck around the 200 range for a year now, follow an AIP diet also for the past year. Dr. Izabella, thank you for your insightful articles, I have followed you for several years after diagnosed with/Hashi “the monster”, lol. I’ve been following the AIP protocol since & did well until my husband had a near fatal crash. The long chronic stress took it’s toll, especially my gut. Have ALWAYS had issues (constipation) & bloating, but really bad past year. I do ok for a while, then it gets bad, ok again, then bad. That’s stressful. It’s always elusive! It surely has to be SIBO?? Does SIBO have a roller coaster pattern like that? That’s what holds me back from spending money on tests. Your insight would be so appreciated! Thank you so very much! Sue – you are very welcome! I appreciate you sharing your journey! I am so sorry about your husband, I hope he is doing better. My heart goes out to your both. <3 We know that intestinal permeability (aka leaky gut) is present in every case of autoimmunity and often precedes the development of Hashimoto’s. Symptoms of leaky gut may include bloating, diarrhea, constipation, stomach aches, acid reflux and irritable bowel syndrome. According to the Institute of Functional Medicine, many people develop IBS 5-10 years before an autoimmune diagnosis. I was one of them and didn’t take my gut health as seriously as I should have. Gut problems are often caused by infections like H. pylori, parasites like Blasto, SIBO, an imbalance of bacteria, and enzyme deficiencies or food sensitivities (especially to gluten, dairy, and/or soy). Even stress can be a factor in gut permeability. Here are a couple articles you might find interesting. I am going through the self-management course and loving all the information! It is so rich and worth every cent!! I recently printed off the Histamine Intolerance Guide. Back in Feb., my dermatologist told me I was FULL of histamine after checking me for a skin fungus. Not sure why she said that, but it got me to thinking after reading your guide – SIBO can cause the histamine intolerance. My question is this – I have diffused hair loss and losing it even more on my front top hair line and over both ears badly. Been going on for many, many years, so I am at the point of having lost about 75% of my hair all over and worse in those areas. If the histamine and/or possible gut infection or overgrowth has caused my Hashimoto’s, which causes hair loss, can treating the histamine and gut issues resolve my hair loss? I have tried everything to fix this. I am dairy, gluten, grain, soy, sugar, gluten cross-reactors, free. After reading your guide, I have discovered that I do not have food allergies as I thought. Your risk assessment in the self-management course said I was at high risk for infections, etc. My doctor put me on iodine and you address my question about that, thank you!!! so my TPOab. tripled and TSH tripled. Functional Doc put me on a T3 supplement and re-checked 7 weeks later. TSH cut in half to below 4 but my TPOab went up from 462 to 472. I know I am all over the board here, so if I check and treat possible infections, will my histamine intolerance stabilize and possibly grow hair and drop antibodies? My other thyroid numbers are not too bad, most in the low healthy functional range or clinical range. I am so incredibly grateful for all your resources, blogs, etc. I finally feel like I am on the right path after going to three doctors with hardly any results. My main issue is hair loss. God bless you!! Peggy – thank you so much for reaching out and sharing your journey with me. <3 I understand how upsetting this can be. Hair loss is a distressing symptom experienced by women with Hashimoto’s. For women, our hair represents our femininity, and losing our hair is a constant reminder that something is off and that we are not well. Since you are in the Hashimoto's self management program, please email my team at info@thyroidpharmacist.com and they will be happy to help you. Thank you so much! I will do that! And, thank you again for all the wonderful research you are sharing with us. So very grateful!! Hi dr.i have hashimoto disease too and i have too much gas 10 minute after eating food. I get sick almost every two month.I have a itch in my throat.and i should consume drug to heal. Do you know what the reasone is? Gm – thank you for reaching out. We know that intestinal permeability (aka leaky gut) is present in every case of autoimmunity and often precedes the development of Hashimoto’s. Symptoms of leaky gut may include bloating, diarrhea, constipation, stomach aches, acid reflux and irritable bowel syndrome. According to the Institute of Functional Medicine, many people develop IBS 5-10 years before an autoimmune diagnosis. I was one of them and didn’t take my gut health as seriously as I should have. Gut problems are often caused by infections like H. pylori, parasites like Blasto, SIBO, an imbalance of bacteria, and enzyme deficiencies or food sensitivities (especially to gluten, dairy, and/or soy). Even stress can be a factor in gut permeability. Here is an article you might find interesting. Thanks so much for all your clear instructions. I have suffered with Hashimoto’s for many years and actually had to almost diagnose myself. Also got my med changed to Nature Thyroid (despite dire warnings from MD) from levothyroxine. Am finally seeing nutritional/functional doctor (talk about expense) but digestive issues are 100% improved after only 2 weeks on elimination diet. So I do have SIBO that was so bad I dreaded any social interactions, even family. Hopefully someone will start to work on the insurance and government industries whose main objective is to keep people sick or at least mandate functional medicine to be covered. Would be interested to know if you have ever looked into homeopathy for Hashimoto’s.